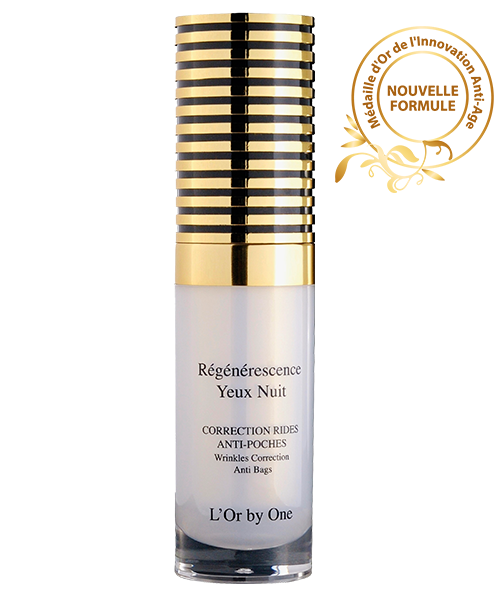 Régénérescence Yeux Nuit is a unique formula for cellular rejuvenation during the night. It acts by slowly releasing a very high concentration of active agents into the cells and, in a few nights, erases the ravages of time. It acts in several ways: it smoothes wrinkles and fine lines, reduces circles, pouches and swelling, and firms up and improves the elasticity of the thin, fragile skin around the eyes. This indispensable treatment with its supple, silky texture has a lasting effect on the firmness of the skin around the eyes. - The patented, natural anti-aging compound, BNF/I, uses the skin's night-time rhythm to regenerate the production of collagen fibres and stimulate microcirculation. - The synergy of BNF/I and Alpha hydroxy acids enables the hydration of the epidermis to be improved and stimulates the firming-up of the skin around the eyes. Apply every evening around the eye, pressing gently to optimise microcirculation.